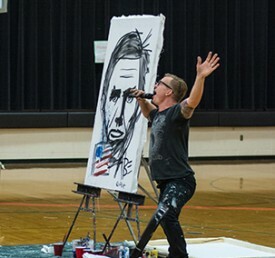 Painting Hope is a live art performance and presentation by ERIC SAMUEL TIMM that brings hope, inspiration, and empowerment to audiences internationally. 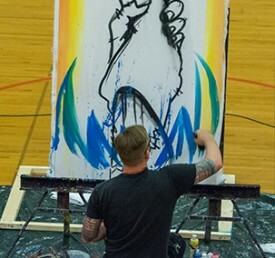 In PUBLIC SCHOOLS, Painting Hope is transforming ordinary assemblies into life-changing experiences with lasting staying power. Students rave about our programs. In the CORPORATE WORLD, Painting Hope is transforming “motivational speeches” into impactful calls to action. Through unique collaborations with COMMUNITY MENTORSHIP and health-based COUNSELING SERVICES, Painting Hope is transforming individuals. In DISASTER RELIEF EFFORTS, Painting Hope goes to the heart of the impacted area and helps unify those involved while raising support from those who are able to help. 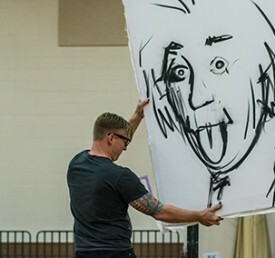 “I thought Eric did an excellent job of drawing the students in with his humor and it set the stage for when he got serious. It’s well worth the time and money spent." “Truly fantastic! It was professionally run, they stayed on time, it was a great message, Eric was outstanding." 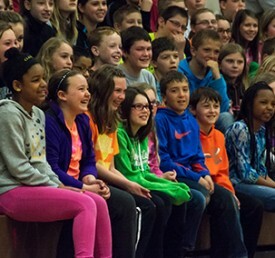 “All the students were attentive and engaged. Immediately that day, we had students speaking up and advocating for themselves as Eric encouraged them to do during the program." Painting Hope is a 501.c.3 nontprofit that offers hope and inspiration through art.